Superstorm Sandy's economic effects are popping up like the dark clouds of a hurricane. In The Perfect Storm we predicted Sandy would negatively impact Q4 GDP by 0.5 percentage points. The Philadelphia Federal Reserve's survey of professional forecasters recently downgraded their Q4 GDP estimates by 0.4 percentage points to 1.8% annualized Q4 GDP growth. There are some estimates which are as low as 0.5% Q4 GDP, much of the downgrades due to superstorm Sandy. Now the data is rolling in, like the storm surge itself. Sandy hit the New Jersey coast on October 29th. Even while the damage, loss of power, business closings and economic activity would seem to go negative after that date, October industrial production was hit with a full percentage point of Hurricane Sandy related contraction. Initial unemployment claims are simply getting hammered by Sandy's effects. Some of the highest population densities in the country were hit by Sandy. The BLS has put up an awesome graphical display of regional labor data as well as storm maps for the areas hit. Below is their tally of 2011 averages in potential payrolls affected by the storm. October retail sales showed a -0.3% decline. The Census couldn't separate out the effects of Sandy due to the reporting methodology, yet on an informal basis they noted a significant drop in sales due to stores being closed and people not being able to get out and shop. On the other hand, some stores saw a huge uptick in sales due to people preparing for the storm itself. Consumer spending isn't even available for October. Right now all we have is Black Friday hype versus real estimates. The Census also has a slew of regional data for affected areas of the storm and due to the density of people and businesses in the region, it's much more than one would expect. According to a summary provided by the Census, the total employment impacted by the storm is 10,633,358 with $1.4 trillion in annual payroll. The total number of business establishments impacted was 748,441. Below is a table of the counties declared disaster areas along with their percentage of total state employment. As we can see it's the majority for New York and Connecticut. Trade will also be impacted as ports closed and were damaged. Ports affected by the storm accounted for $22.6 billion imports and $12.7 billion in exports in November 2011. For comparison's sake, using not seasonally adjusted Census data, the national total imports for November 2011 were $190.2 billion and exports were $125.9 billion. Shutting down major ports for the storm will have an impact on trade flows and thus GDP. While anything that reduces imports sounds great, businesses often use raw imports to make other products and there is a slew of industry surrounding unpacking shipping containers. Most of China's cheap goods come into West coast ports, whereas the East coast ports deal more with European and Canadian trade, so we cannot estimate the real trade impact on Q4 GDP but we expect it to be negative as our largest trade deficit is with China, not Canada. New residential construction was not hit by Sandy, but only due to the smaller geographical region plus the storm hit in just the last few days of the month. November might be a different story, although construction due to rebuilding might start in November. New Jersey now estimates the damage caused by Sandy to be $29.4 billion. Earlier New York has estimate their damages to be $33 billion. In response to the unprecedented and widespread damage caused by Hurricane Sandy to personal property, businesses, transportation and utilities infrastructure, as well as New Jersey’s $38 billion tourism industry, the Christie Administration has completed a preliminary cost analysis of those damages, which puts the total cost at approximately $29.4 billion. The estimate will be further refined in the days and weeks ahead. In spite of this we now have headlines blazing in the press claiming Hurricane Sandy will give a $240 billion boost to the economy. Not so fast my friends, that's the total high end estimate cost to reconstruct damaged areas, not economic growth. Current claims are reconstruction will add up to 0.5 percentage points to 2013 GDP. Replacement construaction isn't growth but transfers, reimbursement from insurance. The 0.5 GDP boost estimate assumes construction will also add reinforcements, construction improvements, beyond replacement, which of course is yet to be seen. Considering the problems with insurance reimbursements for damages, it's questionable to think construction beyond replacement will be so booming. Additionally, one cannot recover the wages, sales, lost transportation and all of the other economic activity shut down by the storm. It's gone, washed out with the receding tides. We don't believe natural disasters tied to over 100 deaths and billions in economic activity losses will eventually boost the economy. More it is possible that the impact is small when taking an average over many quarters. For Q4 2012, it's clear Sandy with negatively impact that quarter's growth. 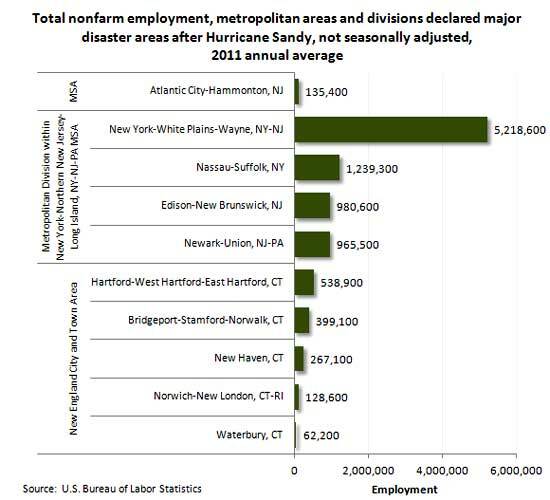 Anyone looking at the employment figures for the area thinking Sandy will help employment is smokin' crack. Sandy set employment back on it's heels for some time to come. Additionally, many homeowners will not be covered by their insurance due to the classification of the storm as flood damage. Below is a Bloomberg Law video discussing the various nuances of homeowners insurance and the storm. In terms of wealth, there is nothing good about the natural and human destruction of a tornadic hurricane. Where I live, i have witnessed 72000 homes compromised or destroyed. There is a bright side in economic terms to the rebuild. The rebuild is an enormous struggle, but one with real benefits to the landscaping and construction industries. Parts of ground zero involved the 72000 homes destroyed on the shoreline. The second part of ground zero were the isolated, inland parts of western New Jersey and Long Island, cut off from power, food, medicine, internet. The shore was devastated in proportion to the height and width of dunes. It is said, they will rebuild. That statement is huge and loaded and all about who recovers and where they live. Neighbors owning property on private beaches complain of uninsured flood losses. After I use my chainsaws to cut them out of the devastation, how much can I or anyone sympathize with property owners in towns where the beachfront is private, owners only access? No one with beach front propery, thanked me for cutting them out. They had no transportation otherwise. I would still help them, the work had to be done. From the corporate-state, you get almost no help. The executive of the utility companies get rich by not modernizing the grid. I watch neighbors buy natgas generators after buying gasoline generators after Irene, following murders in the lines to buy gasoline, hundreds of cars, and pathetic five gallon holders, doing the MadMax RoadWarrior thing. In the intervening weeks, as a matter of survival, we banded together. We cut through roads downed by hundred foot trees. Knowing help would be late to come, we patched chords into transformes on boilers, then to inverters attached to car batteries to get juice to fire boilers. We use hotspots when utility poles were destroyed. Cell towers were down. Of 500 hundred utility poles destroyed by Sandy 50 were in my town and 10 were within 250 feet of where I live. There are some lessons. I will try to summarize. There is a side of economics of unemployment, that are so subjective. In the midst of catastrophe, I found a client.